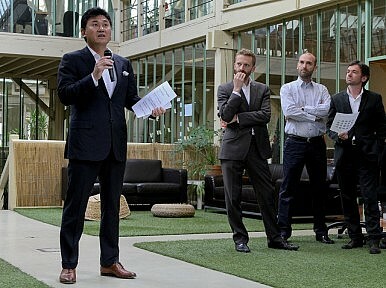 From leading a green drive to a focus on learning English, Rakuten isn’t your usual Japanese company. Japan-based online shopping mall operator Rakuten made international headlines in 2010 when it announced it would make English its official company language by 2012. At the time, President Hiroshi Mikitani even stated that board members who aren’t able to speak fluent English within the following two years would be fired. Such a move is still considered highly unconventional for a large Japanese corporation, but it seems alternative policies are often what make this company tick. And Rakuten’s exceptionally quick response to the earthquake and tsunami that struck the country on March 11 was impressive, to say the least. Within days of the disaster, the Rakuten Group announced that it would donate close to $4 million toward recovery efforts in the affected areas. Overseas sister companies including Rakuten Taiwan, Tarad.com in Thailand and Buy.com in the United States also immediately jumped on board to help with the effort. To help reduce the amount of electricity being consumed in its head office in Tokyo as fears loomed over power shortages following the crippling of the Fukushima nuclear plant, Rakuten immediately started rotating its staff so only half of its employees would be in the office each day. They also started better utilizing natural light in the daytime and strictly limiting the use of high-energy consuming machines. According to recent reports, online shopping is a $5.5 billion market in Japan, and currently comprises approximately 3 percent of the country’s domestic retail market. The Diplomat recently spoke with Rakuten spokesperson Batsuren Enkhtur, who told us that while the company only started its international service 2 years ago, it’s now representing 36,000 Japanese merchants, with many of them offering products to consumers all around the world. And in the last two years, the company has expanded at least five-fold. In the two months since the Tohoku earthquake, Rakuten has also seen a major surge its online sales of energy-efficient appliances. For example, its sales of ‘fridge curtains that limit energy loss are triple what they were last year,’ while cooling mattress covers (to cut down on air conditioner use) have sold 10 times the pace of this time last year. If Rakuten and its consumers are any indication, the new energy-saving movement in Japan is off to a good start. Rakuten to Jump Keidanren Ship? Rakuten boss Hiroshi Mikitani publicly mulls abandoning the Japan Business Federation over electricity policy. Understanding Japan’s Struggle to Reform the Shareholder-Management RelationshipNorth Korea Crisis Hits Asia’s Biggest EconomiesDid Abe Convince Trump Japan Wasn't a Currency Manipulator?China’s Zombie Companies and Japan’s Lost Two DecadesA Weaker Yen Is Coming: Who Are The Winners and Losers?